SSCL, a joint venture between the Cabinet Office and Sopra Steria, aims to deliver £1 billion of savings to the government by 2020. By bringing together the best methods of driving change, it delivers many services from finance & accounting to recruitment. Combining 10 company cultures at once is no small task. SSCL was in search for a platform that could unify the company and allow for collaboration across sites. They didn’t just want an innovative tool or strategy, they wanted to develop an innovative organisation. Wazoku’s Idea Spotlight provided exactly what they were looking for, technology that would enable innovation and a platform that could touch everybody. SSCL took steps that guaranteed every idea put into the scheme was acknowledged and appreciated, encouraging employees to get involved and ensuring their chances of success. SSCL used incentives such as prizes to encourage employees to collaborate in Idea Spotlight in a constructive way. Having the determination to see ideas through from conception to completion was also crucial to the success of the platform. 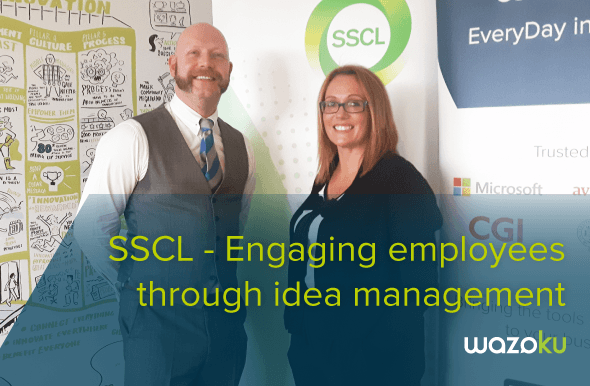 In under one year SSCL saw tremendous success with Idea spotlight. Over 400 ideas were submitted, engaging over 67% of employees and realising a 400% ROI. SSCL also ranked 11 percentage points above the UK national average for Innovation & Continuous Improvement in Great Place to Work. SSCL’s internal innovation has reached a point where it naturally drives itself. The company now hopes to expand innovation efforts to reach clients as well, breaking down all barriers to build a culture of EveryDay innovation throughout its network. For more information, watch our SSCL Webinar!